Festivals don’t come much wackier or messier than this one. Beginning in the last fortnight of August in the town of Buñol near Valencia, trucks full of tomatoes start arriving. This is because every year the inhabitants of the town have a massive tomato throwing fight. The origins of this bizarre event aren’t clear, although many think it dates back as far as 1945. The day of mayhem is held on the last Wednesday of August with the hour long battle coinciding with a fun filled street party. Because of its popularity (it can attract up to 50,000 people) the event is now ticketed with entry costing ten euros. Those taking part are advised to take goggles and a snorkel! This festival will make the hairs stand up on the back of your neck and give protective parents everywhere a shiver. 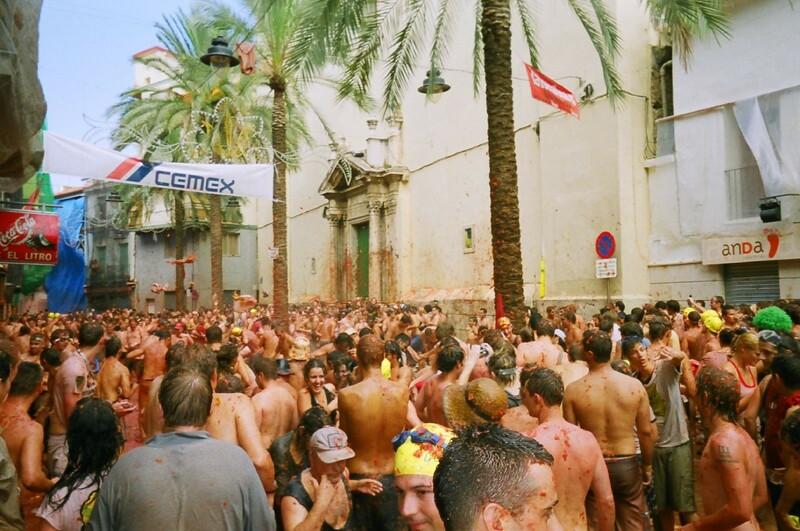 Taking place on the first Sunday after the Catholic celebration of Corpus Christi (at some point in June) this combination of religious rite and Spanish folklore sees babies laid on the ground whilst grown men dressed as devils jump over them. The ritual is said to cleanse the babies’ spirits of evil and anyone with a newborn is allowed to take part. By any standards this centuries old tradition is a strange sight to behold and for those with a nervy disposition possibly one to avoid. The event has even caused controversy within Catholic circles with Pope Benedict XVI asking Spanish priests to distance themselves from the event. However, there have been no reports to date of baby’s being harmed so it follows that they must know what they’re doing. Forming the main attraction in the Spanish festival of San Fermin, The Running of the Bulls sees bulls charge behind a crowd of runners for 825 metres through the streets of Pamplona. The run began as a way for locals to get bulls from outside the city into the bullring but now draws around 20,000 runners each year from all over the world. This event is indeed as dangerous as it sounds with many injuries to participants recorded and even deaths! The risky run takes place from July 7th to 14th at eight o’clock each morning. The run usually last between three and four minutes although it can sometimes take over ten minutes, especially if one of the bulls becomes isolated. For those travelling just to witness the spectacle the atmosphere can be emotional, with passionate chants and songs ringing through the city. These popular events draw thousands of international spectators every year, promising an authentic taste of Spain and in some cases, a pretty serious adrenaline rush. Stay safe and enjoy yourself! Image by Flyheatherfly, used under the Creative Commons license.